Corradino d’Ascanio’s collaboration with Piaggio began in 1931, on the development of a new mechanical component that would revolutionise aviation history. 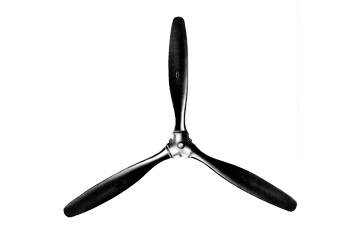 On the variable-pitch propeller, the pitch of the blade can be modified, with electro-mechanical components, in order to obtain maximum yield in a certain speed range: consequently, the engine works constantly at the set speed (cruising speed or maximum speed) and the propeller changes its (angular) speed according to the pitch (a magnitude of distance travelled by a propeller in a rotation). 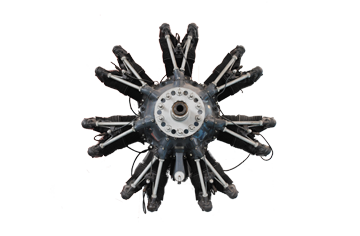 In fixed-pitch propellers, the propeller speed depends only on the number of revolutions of the engine, which entails intervention on the engine speed. 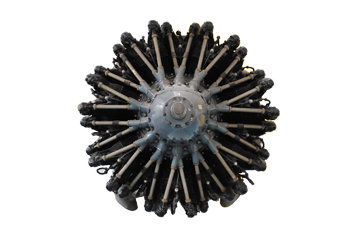 With the variable-pitch propeller, control of the aircraft was greatly simplified and use of the engine was more efficient. The great technological innovation represented by this invention meant that demand increased rapidly in the pre-war and war years. Before the outbreak of World War II, in fact, almost all the aircraft produced in Italy were fitted with propellers designed by d’Ascanio, in the various two-blade, three-blade and four-blade versions. Piaggio engines were initially called Stella (“star”). A number that indicated the number of cylinders on the engine followed the name. Successively the letter P and a progressive number in Roman numerals were added: if the engine had a reducer it was marked R and if it had a compressor it was marked C. There was also a number indicating power rating in bhp. From the commencement of its engine production to 1943 Piaggio designed and produced 16 different engine models, starting from the 370 bhp P.VII and ending with the 1,500 bhp PXXII. The first of the “P” series vas the PVII N with seven radial cylinders, developed in 370 to 500 bhp versions. The PVII was used on numerous Italian aircraft and propelled the first postal connection between Italy and South America on the SIAI S.71 aircraft in 1934. The PVII was also built in a special version (PVII Z) with a PIAGGIO AS80 no-float carburettor. in this version it obtained the world record for the duration of an inverted flight in 1933 on a Caproni Ca.113. in 1934 the pilot Renato donate broke the altitude record, reaching 14.443 metres, over a thousand metres higher than the preceding record held by Lemonine. For this endeavour he was given a specially adapted Caproni Ca.113 with a PVII C35 engien modified for high-altitude flying and equipped with an automatic oxygen machine. the 370 bhp PVII RC 35 featured a wing span of 10,5 metres, a length of 7,4 metres, a height of 2,75 metres and a speed of 250 km per hour, with a 300 km range (without refueling). the Caproni Ca.113 was a racing aeroplane with very acrobatic capabilities that became famous for the many records it broke. Piaggio engines were initially called Stella (“star”). A number that indicated the number of cylinders on the engine followed the name. Successively the letter P and a progressive number in Roman numerals were added: if the engine had a reducer it was marked R and if it had a compressor it was marked C. There was also a number indicating power rating in bhp. From the commencement of its engine production to 1943 Piaggio designed and produced 16 different engine models, starting from the 370 bhp P.VII and ending with the 1,500 bhp P.XXII. The (14-cylinder) 610 bhp, air-cooled P.XI RC with reducer and compressor went into production in 1934. In 1938 the P.XI RC 40 version reached a 1,000-bhp power output at an altitude of 4,000 m and was mounted on several Italian aircrafts. The P.XI is the most famous of Piaggio’s engines because it holds various records for altitude and speed on loaded aircraft made by Piaggio and other brands, such as the Caproni Ca.161 and SIAI S.79. The multiple versions of the basic RC 40 engine demonstrate the dedication of Piaggio and its engineers Aldo Spolti and Eugenio Mancini to the research for performances that would suit aircraft operational and reliability needs. 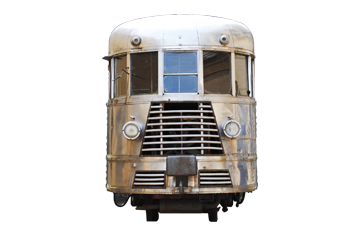 In mid 30s Piaggio was the first in Italy to start building stainless steel railcars, electric locomotives, and normal carriages, using an exclusive soldering procedure studied by the Budd company of Philadelphia. The decision to use stainless steel permitted to eliminate most of the maintenance operations of the external walls, in particular the ones that had to be periodically re-painted. In 1937 the Ferrovie Calabro-Lucane (Railways of Calabria and Lucania) were supplied with ten standard-produced stainless steel railcars with bogies and electrical drive, like the model present at the Museum. The Moscone (“bluebottle”) was created in 1949 and advertised in product brochures as a seafaring Vespa. Piaggio’s aim was to market a speedboat with an outboard motor that would be as successful as the Vespa in the pleasure craft sector. The Moscone was practical, light and manouevrable. It could be equipped on request with an extension cable to hook on to the hulls of larger craft with bigger engines and faster acceleration. 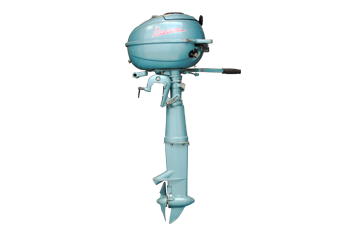 Its lightness, the ease with which it could be attached to a bigger boat and its manouevrability; its simplicity of use and maintenance and its complete fairing to protect sailors made the Moscone the ideal outboard craft. With steady running at any engine rpm and a good power output and idling speed, the Moscone was adapted to any kind of use. 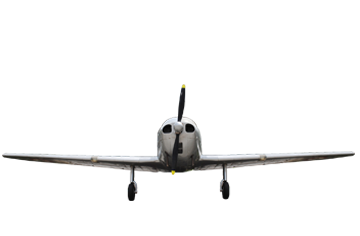 Between 1950 and 1951 Piaggio develops a three-seat basic drill aeroplane, as well as a single-engine two-seat acrobatic one with an entirely metal strcture, abreast seats, low wings and a fixed rear three-wheel undercarriage. The first 70 aeroplanes were produced for the Italian Airforce, which used them in 1952 at the Scuola 3° Periodo in Lecce. Later on, in 1962, eight Piaggio P 148 aeroplanes were transferred to Somalia. In 1953 a five-seat version with a more powerful engine and a retractable undercarriage –the P 149- was developed by Piaggio and used by the German Airforce for training and connections, as well as for tourism and civil use. It was sold in Nigeria, Tanzania, and Uganda. The end of 1946 saw the birth of the Ape, the little three-wheeled transporter derived from the Vespa. 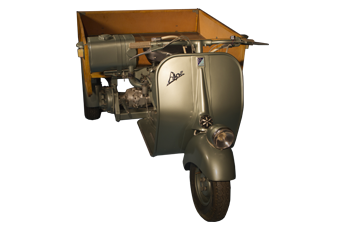 powered by a 125 cc engine until 1952, the Ape moved up to 150 cc in 1953 when it also appeared in box body, van and caliche versions. it had a four-speed gearbox and a capacity of over 200 kg. if the original Vespa put the whole of Italy on wheels, the Ape made a decisive contribution to the revival of trade and goods transport in the tough years of reconstruction after World War II, so much that it became the symbol of Italy at work once more. The ape went on to be a huge success around the world (where it was marketed as the Vespa Commercial) thanks to its incredible handling and its superlative payload/tare ratio. 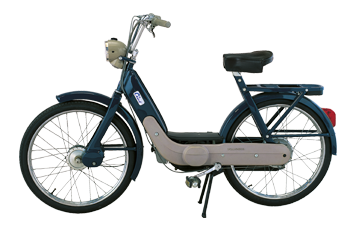 The patent for the industrial model of a moped was registered on 30 September 1955 in Milan by Piaggio & C. S.p.A. The frame was formed by two pressed plate monocoques welded together electrically. The rear mudguard was formed by the beam obtained joining the two parts, including the fuel tank, the tools holder and the rear light. Two coil springs covered with rubber form the rear suspension, while the front one is of the “biscottini” type, with pressure springs, a system which will be used twelve years later on the first moped produced by Piaggio, the Ciao (1967). On 30 September 1955 the patent for the central trestle secured to the casting of the engine carter is also registered. The production of the Ape AC began in 1956 introduced the possibility of adding a windscreen or a cabin body complete with doors to protect the driver to the basic concept. The calèche version of the Ape AC homologated “for combined passenger or goods transport” could carry three people or 250 kg of cargo, plus a second passenger on the front seat up to a maximum permitted weight fully laden of 650 kg. This model too could be equipped with the reverse gear device with the lever control positioned as an optional on the right bottom side of the driver. expansion with mechanical drive and hand lever on the handlebar for the front wheel, with hydraulic foot-operated drive for the rear wheels. Expansion handbrake on the differential. From the moment it appeared on the market in 1947, the Ape showed itself to be an innovative product capable of being continually transformed for all sorts of uses. The Ape was based on Enrico Piaggio’s idea of an easy to drive, low cost, low maintenance and versatile three or four wheeler for goods transport. Over the years the vehicle appeared in several different models whose sole common feature was their adaptability to any market and any utilisation. 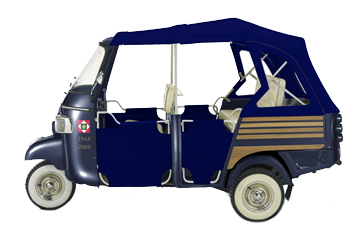 The engine displacement was enlarged, and with the 1960 Pentarò model the Ape acquired five wheels to increase its loading capacity and, above all, to have more than one trailer and just one engine. 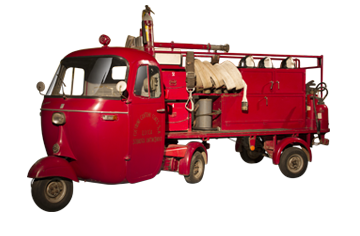 The firemen’s version of the Ape Pentarò exhibited in the Piaggio Museum is a perfect example of the different uses the vehicle could be put to. This model was used until early 2002 in the Lucca factory of the Cucirini Cantoni Coats company and lent to the local firemen’s squad. This vehicle has a detachable semi-trailer with extinguisher pumps, a toolchest, first aid kit and stretcher and a siren on the roof of the driver’s cabin. 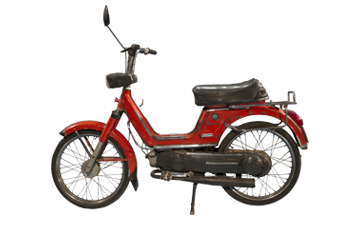 Towards the end of the sixties, Piaggio launched a completely new product on the market: the Ciao. For some time Pontedera’s designers had been studying such a moped. A vehicle called the “Vespino”, or “Little Vespa”, had been patented in 1955 and built by MotoVespa of Madrid, Spain. The Ciao’s launching brought immediate success, and became the symbol of the upturn in production after 1966’s devastating flood. 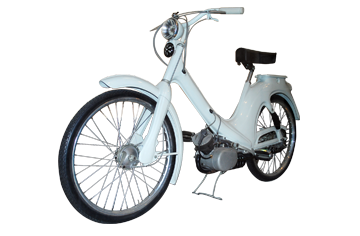 This new lightweight vehicle became the head of a long line of other mopeds that entered into production afterwards. In 1970 Piaggio launched a new moped, the Boxer . The first series (produced until 1979) used the saddle as a reservoir, mounted high wheels and was equipped with a single seat . The second series , produced from 1979 to 1983, was equipped with dual seat . On 16 September 2008, Piaggio chairman Roberto Colaninno presented the President of the Italian Republic, Giorgio Napolitano, with a special version of the new Ape Calessino decorated with the insignia of the Quirinale Palace, marking the 60th anniversary of the Constitution of the Italian Republic (1948-2008). 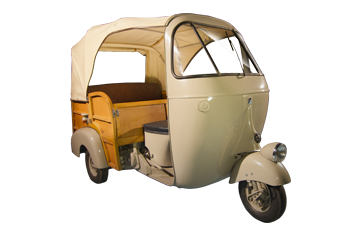 A copy of the vehicle can be seen at the Piaggio Museum.